Digimon Adventure tri. Part 6 is out today! The end of tri. Thread: Digimon Adventure tri. Part 6 is out today! The end of tri. As confirmed yesterday by Toei, we should all be able to watch Digimon Adventure tri. Part 6 Our Future quite soon on Crunchyroll! It's been nearly 4 years since tri. was first announced, and it's almost 3 years to the day we first found out the form of the anime, along with the new cast playing the kids. Under 3 years from the release of Part 1 to Part 6 is pretty good when you consider how long film and OVA series can take to come out. Crunchyroll hasn't confirmed an exact time (as of the time of this posting), but we expect it to be between 8 and 10am Pacific based on earlier releases. We expect it to be unavailable for free members until roughly a month from now. The streaming regions are likely to be the same as with prior parts. Once tri. Part 6 is available there will likely be lots of discussion of it in this thread. I'm sure other people will offer up additional guest passes if they have them in this thread. Anyone have a special setup, snacks, guests, etc. for when they plan to watch? And don't forget, Saturday at 2pm Pacific we will be discussing tri. Part 6 on our live podcast. It's been one of the most exciting periods to be a Digimon fan, if not the most exciting. We've gotten more merchandise the last few years than most of us could ever dream of, from the cheapest can badges and widgets, to figures, to ludicrously expensive watches and artwork to hang on walls. We've gotten a stage play, multiple video games, even another Digimon series in Appmon. Just as a reminder so it doesn't get lost in all the text above. 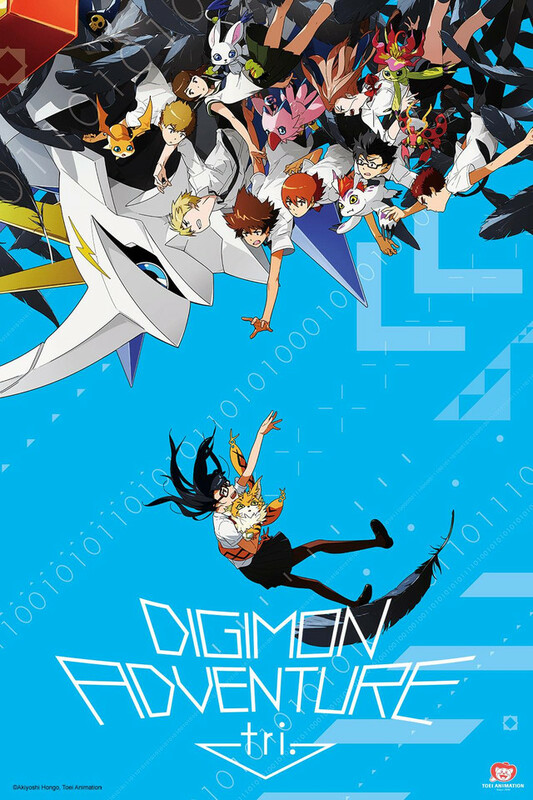 The discussion thread for Digimon Adventure tri. Part 6 is here. Seems i have three passes this time around. Oddly my friends didn't need any.. So pm me here if you need one. Passes are all gone. Enjoy everyone. Last edited by NekoHaruko; 05-05-2018 at 05:06 PM. 4 years? Man, that's insane. In that time, I've moved 3 times, been hit by a car, saw the first Tri dub in theaters while still recovering, recovered, started college, started living on my own...it's been quite a ride. I can't wait to see what's next. I also have three passes to spare if anyone wants them. EDIT: Two One left All gone! Last edited by wildwing64; 05-04-2018 at 05:07 AM. Removed the mention of the illegal sites. Regarding Crunchyroll, please re-read the first post. Last edited by lvr815; 05-04-2018 at 08:55 AM. So does anyone know how long before tri. Part 6 is available for streaming? I might still wait a week. To emotionally prepare and whatnot. It is on CR right now.